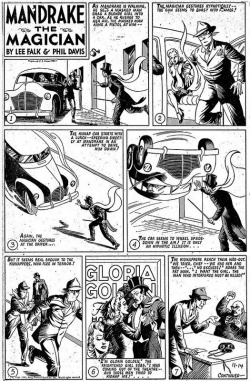 "Gloria Golden" is the 25th Mandrake Sunday story. The story was probably written by someone else than Lee Falk and drawn by Phil Davis. After three attempts the kidnappers succeeds to kidnap Gloria Golden, the famous Hollywood star. Gloria Golden, a famed Hollywood star. Tiny, eks director and now a kidnapper. Ronald Ronald, a Hollywood star. Ma Macree, a Hollywood star. At the deepwoods.org index the title for this story is "Gloria Golden", which is lifted from the plot. This page was last edited on 16 August 2018, at 16:28.